The answer to these questions is almost always, “Because he is discouraged.” He may also be anxious or angry, and he is stuck in this bad mood. He feels that putting effort into his schoolwork is not “worth it” and it is easier for him to pretend that he doesn’t care. He may mask his discouragement with defiance or blame others (especially his teachers) for his lack of effort. Often, he will seek relief in activities that require little sustained effort and that offer, instead, some immediate feeling of success. The problem of “lack of motivation” is the problem of demoralization, whether overt or disguised. To solve this problem, we need to return to first principles: Children, when they are not angry or discouraged, want to do well. They want to feel good about themselves—and about others. They want to earn our praise and approval, and they want us to be proud of them. Children say that they don’t care, but they do care. Sustained effort is a different matter. Our ability to work hard, to sustain effort at any task, requires a feeling of accomplishment or progress along the way, and some confidence in our eventual success. All constructive activity involves moments of anxiety, frustration, and discouragement. Children who are “not motivated” too readily give in to these feelings; they do not bounce back. Children often hide their anxiety and discouragement behind defiant and rebellious attitudes. “What is the point of studying history or math anyway, I’m never going to use it.” “Who cares who the King of England was in 1850?” Good teachers—teachers who encourage and inspire children, and then demonstrate the relevance of learning—can help. But a demoralized child is unlikely to find any relevance in what we want to teach him. He will then be criticized, repeatedly, for his lack of effort, and he will become more rebellious. And he will look elsewhere for a feeling of acceptance and a feeling of pride. How often do we understand the problem of our children’s motivation in this way? How often do we see a child’s lack of effort not as a problem of demoralization but as a “behavior” problem? How often do we blame the influence of peers, or television and other media distractions? How often do we become frustrated and angry, and then, in our frustration, tell him that he just has to work harder? Children are not lazy. They may be frustrated and discouraged, anxious or angry; they may have become disillusioned or defiant, self-critical or pessimistic, and they may lack confidence in their ability. But this is not laziness. The misconception that kids are lazy is one of the most common, and most destructive, misunderstandings of children. When you understand your child’s lack of motivation as a problem of demoralization, you will be able to look for the real causes of her lack of enthusiasm and effort, and you will be more likely to find helpful solutions. 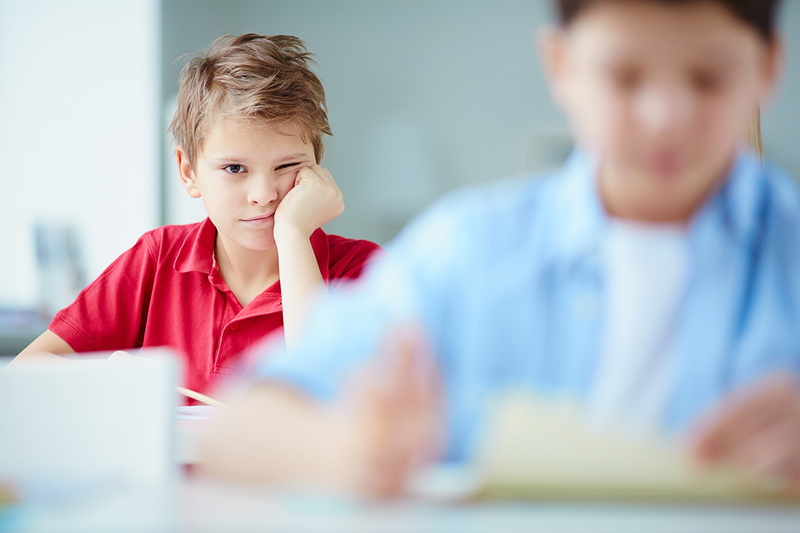 Undiagnosed (or under-appreciated) attention and learning disorders are the most common source of discouragement and lack of sustained effort (“motivation”) in children. For these children, doing schoolwork or homework is like running with a sprained ankle—it is possible, although painful—and they will look for ways to avoid or postpone it. Or they may run ten steps and then find a reason to stop. Motivation begins with interest. Interest leads to exploration and learning, and to the development of projects. Projects then become ambitions and goals. Like all of us, children want to do what they are “good at.” They want to shine and feel proud. And, again, they want us to be proud of them. A child’s motivation is also sustained by ideals. Children want to become like, to learn from, and to earn the respect of the people they admire. Too often, we overlook this fundamental aspect of children’s motivation and emotional development. It is easy to forget that children look to us and look up to us—and that we remain for our children, throughout life, sources of affirmation and emotional support. Rewards and punishments have some short-term effect on children’s effort. We are all motivated, to some extent, to earn rewards and avoid punishment. But rewards and punishments cannot create interests or goals. Fortunately, there are solutions to the problem of a child’s lack of motivation and effort. Following are five important principles parents can use in helping children with this common, but often difficult, problem. 1. Promoting children’s motivation begins with your enthusiastic interest in their interests—even if these are not the interests you would choose. If you look hard enough, you will find in your child some interest—and a desire to do well. When I talk with “unmotivated” students, I often find that they are interested in many things (although not in their schoolwork). They may watch the History or Discovery channels, but they will not read a history or science book. Some read National Geographic magazine, but they do not do their homework. Many of these children spend hours searching Web sites when they should be studying. Even more have become addicted to video and computer games, to World of Warcraft or Call of Duty. We may disapprove, but these are their interests. When I ask children about their interests, they are usually happy to talk. Then, as long as we are respectful and not dismissive, they are usually willing, and often eager, to hear our point of view. They want to know what we think. Too often, in our understandable effort to help our children “improve,” we neglect this vital aspect of children’s motivation. 2. Find the source of their frustration and discouragement. When children are discouraged, they often say that they hate school or hate homework. Or that it is “pointless” and irrelevant. We will rarely be able to talk them out of this, no matter how hard we try. Again, undiagnosed attention and learning disorders are the most common source of discouragement and lack of sustained effort in children and adolescents. It is essential for both parents and teachers to understand the impact of these difficulties. Even mild or moderate attention and learning problems can be a source of anxiety and frustration for children, leading to discouragement, pessimism, and giving up. Acknowledge their frustration, discouragement, and disappointment. Let them know that you understand their feelings. For young children especially, more than anything else, it may help them to know that we have also been frustrated and discouraged. Talking to children about the importance of effort and hard work, however well intentioned and however true, or grounding them for their avoidance of schoolwork, will not help. Children have heard this all before. Telling them that they have to try harder will only make them feel angry and misunderstood. Acknowledge every increment of effort and improvement, even when his effort falls far short of our goal, and express confidence in his eventual success. This may be the essence of encouragement: We make note of a child’s improvement and his progress toward goals, not his mistakes. Remind them, when they are ready to hear it, of the good things they have done and will be able to do, and that no one succeeds all the time. Help them put this failure—whether it is a social rejection, an academic disappointment, an athletic defeat, or a disappointment in any area of endeavor—in perspective. There will be a next time. 4. Focus on their strengths. Help them develop a different picture of themselves. Their strengths should be in the center of the picture; their difficulties and frustrations should be in the corner. In school, we teach children that it is important to do well in all their classes. In life, however, our success depends much more on doing one thing well. Even children with significant learning problems demonstrate areas of competence, or qualities of character, that should be a source of inner pride and a foundation for their future success. These strengths need to be recognized and supported. Finally, don’t give up. Solving the problem of motivation will take time. Demoralization has developed over time. It will take time for your child to learn to overcome his pessimism and self-doubt and to let go of cynical and defiant attitudes. Over time, he has become sensitized to disappointments and stuck in moments of frustration. The more that his demoralization has spread, the more that his pessimism and rebellion have become habitual, the more time he will need.